The February/Valentine’s military care package is always a bit of a dilemma for me. I debate how to send a Valentine package to someone I don’t know. Last year, I focused on chocolate and yellow ribbons in support of our troops. This year it dawned on me that you don’t have to know someone to care about their well being. 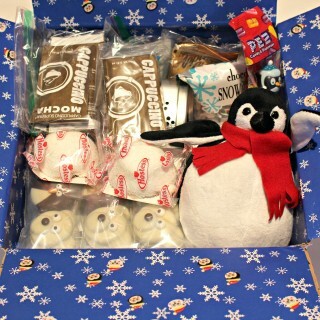 The theme became, “Warm, Caring Wishes” for a box packed with hot chocolate mix and fixings, and chocolate sugar cookies iced to look like mugs. 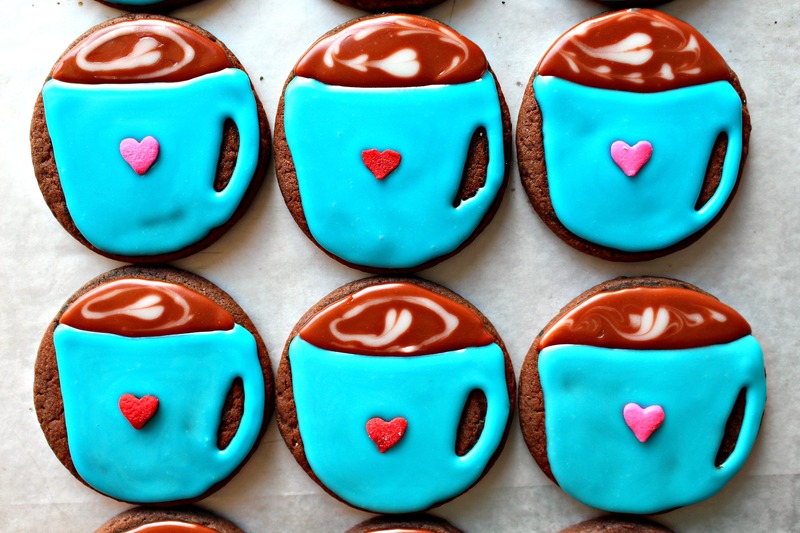 Just like my wishes, the Cozy Mug Sugar Cookies are filled with warmth and caring! I got a quick email from Sailor J. this week! It was very short, one sentence really, but she reached out to let me know that the first care package had arrived. I still don’t know anything about the temperatures wherever she may be deployed, but I did learn that packages will take 3 weeks to arrive. Baking for Sailor J. will be a long shelf-life challenge! Though this “Warm, Caring Wishes” package was mailed out almost two weeks before I got the email, I had made sure to include goodies that would last a long time, just in case. Part 1 Care Package Contents: I glued pink and red doily hearts on the flaps of the box. There are so many doilies in each Dollar Store package that I could have wallpapered the room. I need to figure out a storage system, so that I will know where to find the extra Valentine stuff for next year’s care package. Though I am using these contents in connection with Valentine’s Day, “Warm, Caring Thoughts” would be an appropriate theme all winter. 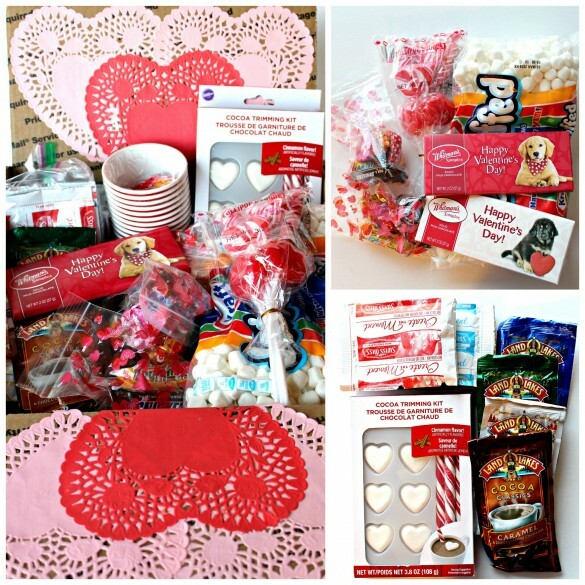 The box is packed with red microwaveable cups, lots of hot chocolate mix, a big bag of marshmallows, heart shaped marshmallows and peppermint mixing sticks. There are also plenty of chocolate bars in Valentine goodie bags for sharing and a bouquet of Valentine lollipops. Part 2 Circle Sugar Cookies: You may need to use your imagination a little on this Cozy Mug design. I envisioned a mug of coffee/hot chocolate (whichever you find more cozy) with heart-shaped barista art on top. If you follow The Monday Box you know that I am an ambitious beginner when it comes to cookie decorating and design. Iced sugar cookies stay fresh for weeks, so they are great for military care packages, but I know they can be intimidating if you are a beginner. All of my care package designs can be done by anyone. I promise. I use circle shapes because without any corners, they pack and travel well. So rather than use a mug shaped cookie cutter, I tried to fit a mug shape onto a circle. The perspective is a little off, but I think the idea is clear. 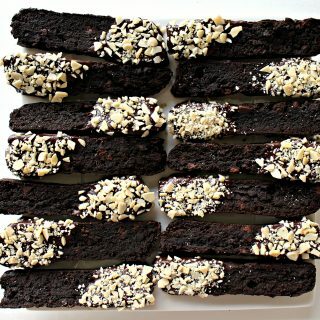 If you look carefully, you may notice that the cookies in the photo at the top of the post are slightly different than the finished cookie in the process photo. The top cookies were mailed in the military care package and I gave a couple of extra cookies to my son. When I complained to my son that the contents of the mug look more on top of the mug than inside, he suggested outlining the brown area in blue like the rim of the mug. His suggestion is definitely a design improvement. So, though I sent Sailor J. the original design, I am providing directions here for the new and improved Cozy Mug design. I used one batch of chocolate sugar cookie dough for 24 cookies and had 6 cookies left over to freeze for later. 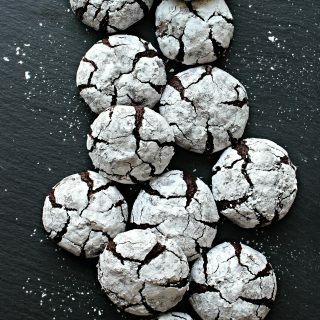 These cookies used one recipe of faux royal icing (corn syrup icing) thinned to the consistency of white glue. Place ¼ cup of white icing in a decorating bag with a very small circle tip (I used #2).Color ½ cup of the icing light brown and place in a decorating bag with a small circle tip (I used #3). 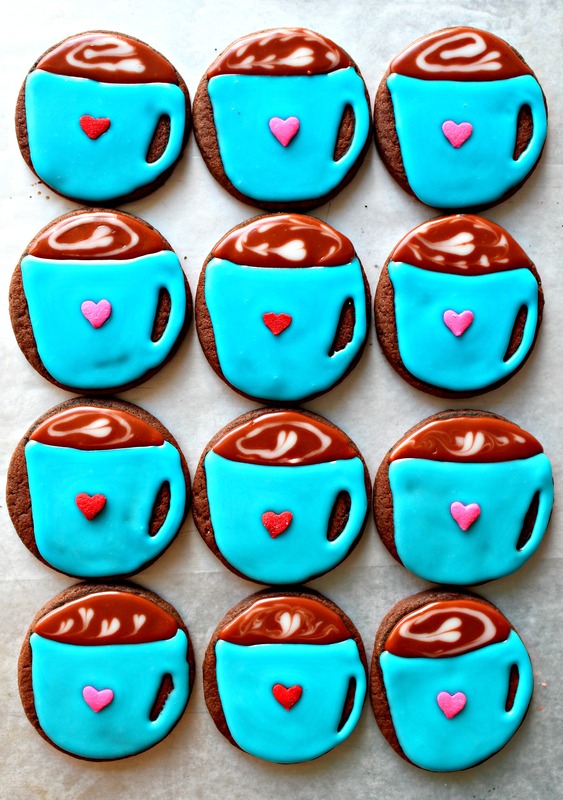 Color the remaining icing blue and place in a decorating bag with a small circle tip (I used #4). 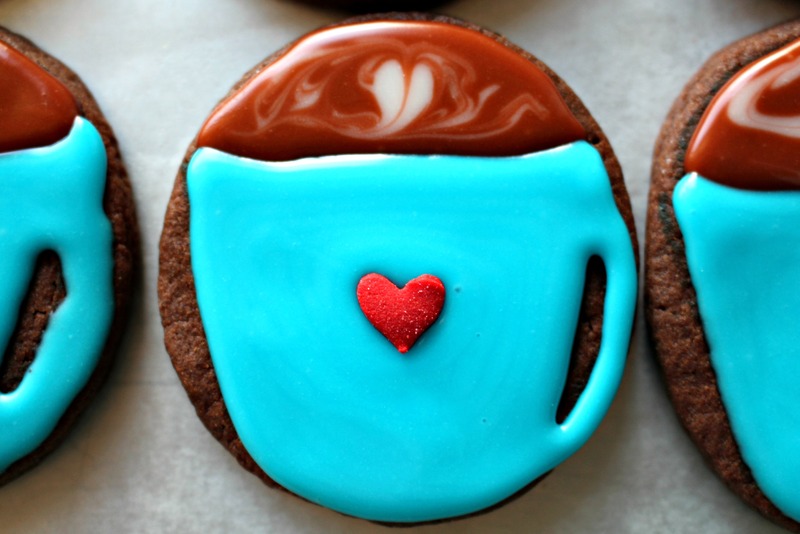 Draw a mug shape that will fit on your circle cookie and cut out to use as a stencil. Using a food marker, trace the mug outline onto the cookie. Use a toothpick to prick holes along the inner mug rim, using the stencil as a guide, then use the food marker to draw the inner rim on the cookie. 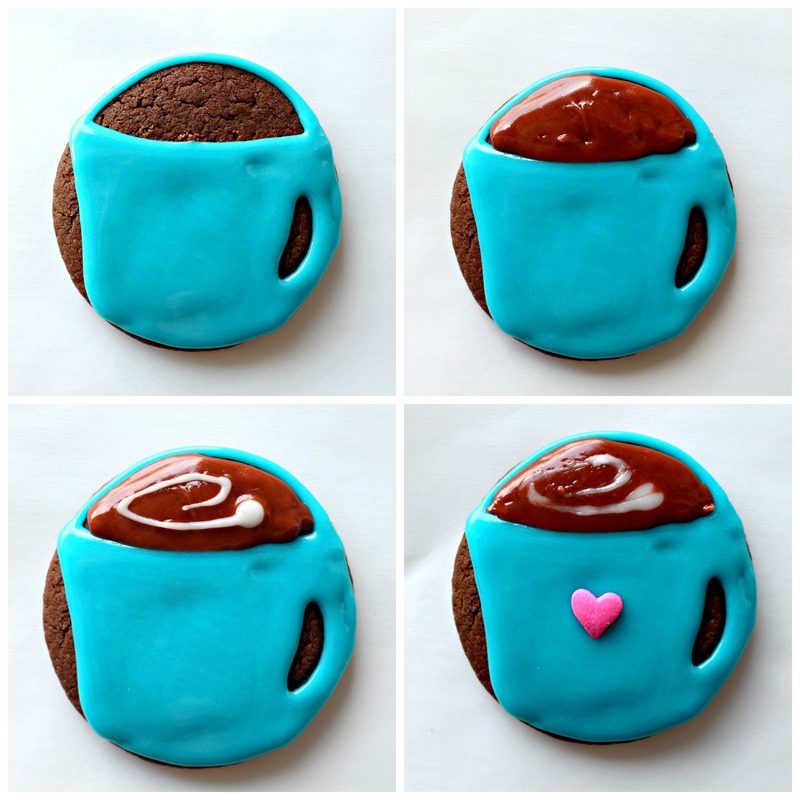 Outline the mug shape using the blue icing, then fill in. Use the brown icing to fill in the mug contents. Use the white icing create “barista art” hearts by adding white dots to the brown and dragging the white icing with a toothpick through the brown icing. Channel your inner barista and play with different designs. Add a heart sprinkle onto the mug icing for a little extra love. Always air dry iced sugar cookies overnight to allow the icing to harden before packing. I used plastic wrap to double wrap each cookie. 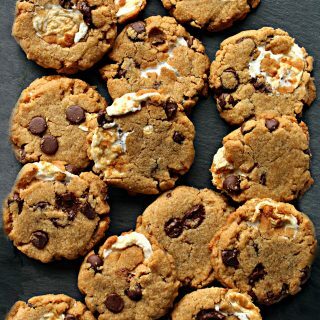 Self-sealing cellophane cookie bags can also be used. The wrapped cookie were then placed snuggly in a plastic storage container for shipping. Part 3 New Recipe: Sugar Cookie Valentine Brownies are the new recipe included in this care package. 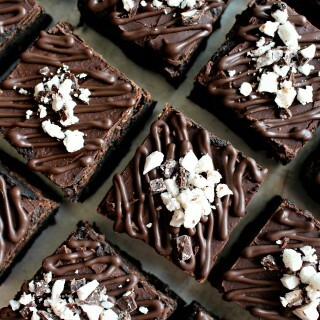 These incredibly fudgy brownies stay chewy for weeks. 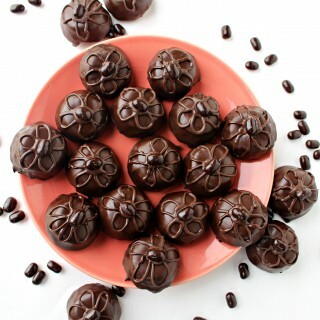 They are a chocolate lovers dream where ever they are served! 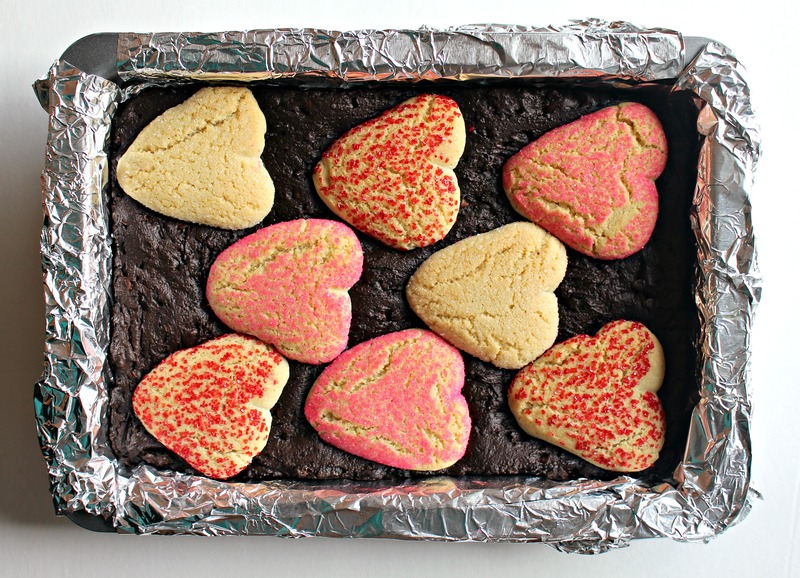 The sparkling sugar cookie hearts were super easy holiday additions using a log of supermarket cookie dough! To preserve freshness, I mailed the entire pan of brownies, uncut, wrapped in foil then double wrapped in plastic wrap. Whether on Valentine’s Day or throughout the year, warm and caring wishes are always welcome. 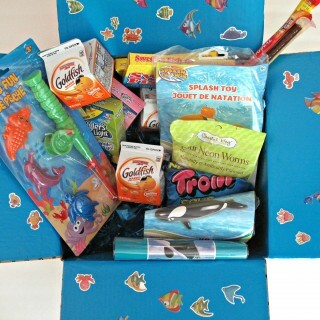 I hope Sailor J. can feel and taste the sincerity of my warm and caring wishes for her safety in this care package. You are sure to enjoy these military care package ideas as well! Click on the image for details! Such a cute idea! there are lovely!! Thanks for the encouragement, Ada! What I lack in skill, I try to make up for with enthusiasm! 🙂 Watching your videos helps! I don’t want to play favorites but I think these are my favorite of all your amazing decorated cookies! Something about the look of these wonderful little mugs of hot chocolate (I’ll go with chocolate but coffee is good, too! : ). They look wonderful, with that heart in the center and that swirl on top! I just love them. Sailor J must surely love your package! Absolutely adorable! These are crazy creative and beautiful. Wendy you should write a book with your awesome ideas. I would buy one! You are always so supportive, Tricia! Thank you! (Though I think you may be wearing rose tinted glasses!) To write a book I would have to figure out how to be in two places at the same time (like Hermione Granger)! You are my favourite cookie artist! Adorable! It is amazing that you can actually do coffee art on a cookie! Brilliant! Got to try this fun technique! Thank you, Lokness! I am not sure that anyone besides you and I see that it is coffee art, but that is the look I was going for, so THANK YOU for noticing it! 🙂 In truth, it is super easy. Just a dot of icing dragged with a toothpick. 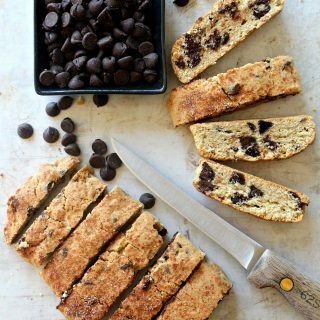 I love the look and have used it in several of my cookie “designs”. Try it! It’s fun! What a wonderful and caring care package. I know that sailor J. will greatly appreciate your thoughtful package. Thanks for sharing at the #ThisIsHowWeRoll Link Party. Omg! I love this! They’re soo cute and creative! thanks for sharing these with us. Happy FF! It really must be challenging developing cookies that last a really long time like this! It’s so lovely that you send these care packages! I really like these Cozy Mug Sugar Cookies – they are absolutely beautiful, a real labour of love. Scheduled to pin. 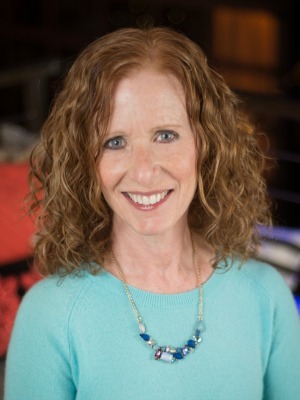 Thank you so much for sharing with Hearth and Soul, Wendy. Thanks, April! Sugar cookies are great travelers. 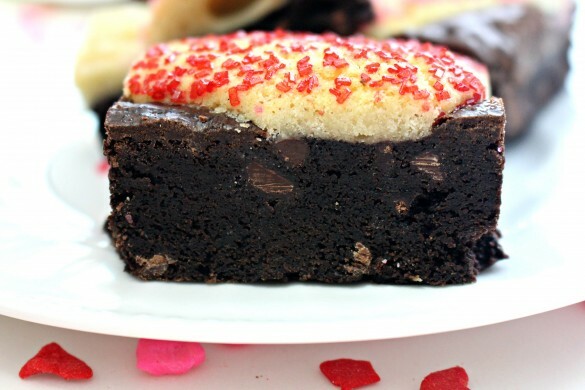 The icing on top helps them retain their deliciousness for a really long time. All of my military care packages are definitely a labor of love. That’s exactly what I am trying to communicate to the troops. They are thought of and appreciated. 🙂 Thanks for pinning and for hosting Hearth and Soul! I love your Military Care Package and they are so greatly appreciated! I really appreciate you sharing with us at Full Plate Thursday, hope you have a great day and hope to see you again soon! Thank you, Jamie! I hope your family enjoys the cookies. Thanks for pinning, too!